Beginning the visit from the right-hand side, the visitor comes across the colossal statue of Minerva. Probably, its model derives from one of the precious statues of Athena, which Pheidias made in Greece in the 5th century BC with the chryselephantine (i.e., with gold and ivory) or acrolithic (flesh in marble, garments in cloth or bronze) technique. The eye cavities were originally filled with hard stones and metal. The visible holes on the belt located on the waist and the still present studs on the chest were used in order to clamp on parts of different material. The cult image has been attributed to Pasiteles’ circle — a sculptor from Magna Graecia who worked in Rome during the first century BC and who advocated the recovery of the technical and stylistic traditions of the past. Perhaps, the statue once decorated the temple of the goddess near the Iseum Campensis located in the proximity of the Church of Santa Maria sopra Minerva. 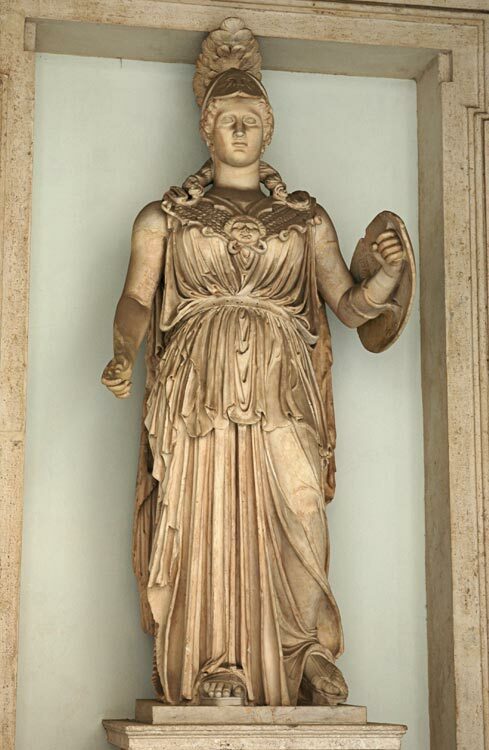 © 2001 Description: The Capitoline Museums. Short guide. Comune di Roma. Electa, 2004, p. 32—34.